Pictured standing from left: Lauren Sonnier, Nkemdilim Mgbojikwe, Amenah Abdelfattah, Marsela Wood, Ellen Ware and Andrea Lewis. Sitting from left: Jaime Carroll and Dustin Domangue. Dustin Domangue is hoping his time as Student Government Association president will help him as he pursues a law degree. In addition, this first-generation college student wants to be a U.S. Diplomat. He recently took his Foreign Service Officer exam. 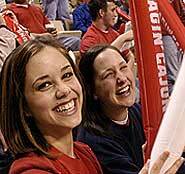 Ellen Ware wasn’t sure of a major when she entered UL Lafayette in Fall 2004. She didn’t let her uncertainty affect her grades. She ultimately decided to major in interior design and she will finish with a perfect 4.0 GPA. These students are among six others who are this semester’s Outstanding Graduates as designated by the UL Lafayette Alumni Association. The students were chosen as Outstanding Graduates by their respective deans. The award is based on leadership, scholarship and service. An overall Outstanding Graduate will be named during Graduate School commencement ceremonies on May 15 at 5:30 p.m. at the Cajundome. Ellen Ware hopes to one day own an interior design practice. But, that’s not before she completes her two-year internship and takes the interior design licensing exam. She also wants to work towards an MBA at UL Lafayette. It’s a lot of work, but the Rayne native has shown she has the perseverance to get it done. The interior design major is finishing her college career with a 4.0 GPA. She is the daughter of Edward and Janice Ware of Rayne. Ware’s academic achievements include being a member of the Honors Program, Alpha Lambda Delta Honor Society and Tau Sigma Delta Honor Society. She’s received numerous scholarships including UL Lafayette’s Academic Scholarship, UL Lafayette’s Valedictorian Scholarship, the Raymond Bourque Sr. Memorial Scholarship and the UL Lafayette Alumni Association Endowed Scholarship. Her awards include two Design Excellence awards and a Design History Excellence award. Ware has participated in numerous university organizations including the Up Til Dawn fundraiser, where she served on the executive board; the American Society of Interior Designers, where she served as treasurer; the Biological Society, where she served as public relations chair; and the Pre-Professional Society and the Student Affiliates of the American Chemical Society. In her community, Ware has chaperoned mission trips to Mexico, retreats at Steubenville and volunteered with St. Joseph Catholic Church and Camp Cajun at UL Lafayette. She also helped with fundraising at Rayne Catholic Elementary. “ I am a very well-rounded individual, not only doing my best in school, but also always trying to help those around me and in the community. I find great satisfaction in helping others and using my various talents and creativity,” she said. Lauren Sonnier, an accounting major, plans work part time after graduation while also pursuing an MBA at UL Lafayette. She ultimately wants to work as a certified public accountant in Lafayette. Sonnier is a 4.0 graduate and is the daughter of Randy and Paula Sonnier of St. Martinville. She is a member of the UL Lafayette Honors Program and has been inducted into the Alpha Lambda Delta Honor Society and the Phi Kappa Phi Honor Society. She’s been selected for Who’s Who Among Students in American Colleges and Universities for 2008-2009 and is president of Beta Alpha Psi. University organizations she is a part of include the Honors Business Society, where she was chair of faculty relations; and the Accounting Society, where she’s been a member since 2007. Sonnier has volunteered for numerous events including Festivals Acadiens et Creoles, Festival International, the Susan G. Komen Race for the Cure, UL Lafayette’s Career Day and holiday parties for the Lafayette Children’s Shelter. She’s received numerous scholarships including the TOPS Honor award, the Dr. Ben and Clare Roy Thibodeaux Endowed scholarship, the Billy and Zoe Bolton Memorial scholarship, the Centennial Valedictorian scholarship, the Literary Rally scholarship, the Regions Bank Endowed Scholarship, the Gulf South Pipeline Company scholarship, the Louisiana Bankers Association Freshman scholarship, the UL Lafayette Study Abroad Program scholarship, the UL Lafayette Alumni Association Endowed Scholarship, the SGA scholarship, Blue Key Honor Society scholarship and the Acadiana Chapter Society of Louisiana CPAs scholarship. Sonnier hopes to earn her MBA in December 2011. Jaime Carroll intends to teach in Louisiana, preferably within the New Orleans recovery school parishes when she graduates. The secondary English education major wants to support the city in its rebuilding efforts. “ I want to offer my time and talents to the city,” she said. Carroll is the daughter of Mitch and Robin Carroll of River Ridge. She has a 3.976 GPA and has been on the President’s List seven consecutive semesters. She’s also been the recipient of numerous scholarships including TOPS, the College of Education Academic scholarship, the UL Lafayette Centennial Valedictorian scholarship, the Louisiana Music Teachers scholarship, the University Honors Program Alumni scholarship, the Oran Robert Perry Burke scholarship and the College of Education Corporal Aaron Robichaux, USMCR Memorial scholarship. Carroll has been active in university organizations and activities including the University Honors Program, serving as representative from 2006-2010; Alpha Omicron Pi Sorority, Beta Chapter, serving as vice president in 2009; Blue Key National Honor Society, serving as community chair; and Ragin’ Peppers Spirit organization from 2007-2009; Associated Professional Educators of Louisiana from 2006-present; and Louisiana Collegiate Honors Council Student Delegate from 2008-2009. Additionally, she has been active in the community as a Sunday School teacher at Faith Lutheran Church and as a volunteer with United Way Connections Exp and Lafayette Walk for Hope. Carroll was a participant in the Blue Key Adopt-a-Highway Clean Up, Habitat for Humanity, St. Joseph’s Diner and Up til Dawn fundraiser for St. Jude Children’s Hospital. “ I am so proud to call myself a Ragin’ Cajun and hope my life after college will reflect the education, spirit and sense of community UL Lafayette has instilled in me,” she said. Marsela Jakub-Wood is a member of the award-winning TEAM BeauSoleil from UL Lafayette. This 4.0 electrical engineering major designed and implemented the photovoltaic system on the solar-powered Louisiana BeauSoleil Home. She is the daughter of Travis and Destari Wood of Eunice. Jakub-Wood’s achievements are plentiful. She is a member of three honor societies: Eta Kapp Nu, Tau Beta Pi and Phi Kappa Phi. She has been on the President’s and Dean’s List throughout her college career and was nominated for Who’s Who Among College Students in 2009. Jakub-Wood is also a member of the Institute of Electrical and Electronic Engineers, the Louisiana Engineering Society and the UL Lafayette Honors Program. She’s received several scholarships including the TOPS Honor award, the St. Landry Parish Sheriff’s scholarship, the Daniel G. Egan scholarship, the Louisiana Engineering Society Foundation scholarship, the Hiram Russell Mason Memorial scholarship, the Keith Lindley scholarship, the UL Lafayette Academic scholarship, the Robert C. Byrd scholarship and the Raymond Bourque Sr. Memorial scholarship. She is also the nominee for the Spring 2010 Outstanding Graduate for the Electrical Engineering Department and the recipient of the Washington State University Integrative Graduate Education and Research Traineeship Fellowship. In her community, Jakub-Wood was named Eunice Black Belt Academy Instructor of the Year in 2006 and has participated in the Louisiana Pro-Am Karate and Kung Fu Nationals and the Stars and Strikes American Freestyle Karate Open. She’s also made several presentations on her with the BeauSoleil home. Jakub-Wood currently works for LUS as an engineering aide along with being a student worker in the Computer Science Department and a tutor with the Learning Center on campus. She plans to pursue a doctorate in power engineering with an emphasis in renewable energy and resources. She’s been accepted to Washington State University. Dustin Domangue is a first generation student who is the current Student Government Association president. He served as vice president from 2008-2009. This general studies major is the son of Doreen Trahan of Woodbridge, Va.
During his undergraduate study, Domangue has placed on the Dean’s List and was inducted to the Pi Kappa Delta honors fraternity in 2005. He’s competed in the Parliamentary Debate Nationals and placed sixth in the nation; and the Policy Debate National tournament where he placed fourth. In 2008, Sigma Gamma Mu awarded Domangue the Most Outstanding Debater of the Year award. His work with the SGA includes managing several operating budgets and serving as a voting member of the Louisiana Council of Student Body Presidents. He successfully lobbied against a NRA-backed congressional bill to allow guns on college campuses. He allocated $50,000 to TEAM BeauSoleil to compete in the 2009 U.S. Solar Decathlon and passed major internal SGA and various external committees infrastructure changes. Domangue was instrumental in creating the first Sneaux Day on campus and led a panel discussion at the National Student Government Summit 2009 in Washington D.C. He was also student chair for research development with the State of Louisiana and was on the UL System’s Student Advisory Council. On campus, he was a member of the Student Orientation staff, the University Program Council, Association of Future Alumni and volunteered for Up Til Dawn fundraiser. Domangue also served as recruitment chair for X-Treme Spring Break with the UL System and is a member of Chi Alpha. He is pursing a law degree and is also applying to become a U.S. Diplomat in the Department of State’s Foreign Service. Amenah Abdelfattah is an English major with a minor in French. She will finish her undergraduate degree with a perfect 4.0 GPA. She is the daughter of Linda Domingue of Lafayette. Abdelfattah’s academic achievements are numerous. They include being on the President’s and Dean’s lists, being a TOPS Honors award recipient and being nominated for Who’s Who Among American Colleges and Universities 2008-2009. Scholarships she’s received include the Kappa Delta Sorority Founders scholarship, the Zonta Club International Women’s English Honor scholarship, SGA scholarship, John Breaux Pre-Law Freshman scholarship, UL Lafayette Centennial scholarship, UL Lafayette Valedictorian scholarship, UL Lafayette Literary Rally scholarship and the Elks Foundation scholarship. She is a member of the Phi Kappa Phi Honor Society, the Sigma Tau Delta English Honor Society, Kappa Delta president, Order of Omega Honor Society, Rho Lambda Greek Honor Society, Alpha Lambda Delta, Sigma Alpha Lambda and Phi Beta Delta Honor Society. She is a member of the UL Lafayette Honors Program, Kappa Delta Sorority, SGA, Association of Future Alumni, University Program Council, Law Club, French Club and the American Association of University Women. Abdelfattah has volunteered with Faith House, Susan G. Komen, St. Jude’s, American Heart Association, St. Joseph’s Diner and many more. She plans to attend Loyola University of New Orleans School of Law upon graduation. “I am extremely excited to move to New Orleans and help with the rebuilding process of the city,” she said. Nkemdilim Mgbojikwe is a 4.0 student who is majoring in dietetics. She is the daughter of Mr. and Mrs. Mgbojikwe of Lagos, Nigeria. She has been on the President’s and Dean’s lists every semester and is the recipient of many scholarships. They include: the UL Lafayette Foundation scholarship and the Edward ‘Ted’ Kibbe scholarship. The latter is given to the international student with the highest GPA. She was the recipient of the Honorary Membership and Medallion, Phi Beta Delta Honor Society and the Blue Key Society scholarship. She was also awarded a certificate of academic excellence by the University Honor Society. She is a certified tutor by the College Reading and Learning Association, and was nominated to Who’s Who. Mgbojikwe served as a speaker for International Day, and was a speaker on nutrition and cancer to the Lafayette Fire Department. She has served as an usher at Crossroads Church and was a data collector for the 2009 Hunger in America Study. She administered surveys for the Second Harvest Hunger in America nationwide study in rural Louisiana. She has volunteered with the National School Lunch Program at Northside High School, Our Lady of Lourdes Regional Medical Center, the American Cancer Society and Chi Alpha Fellowship. She has served as president of the International Student Council at UL Lafayette, vice president of the African Students Association and international student advisor to the University Program Council executive board. Following graduation, she plans to enter medical school, specializing in family medicine or internal medicine. Andrea Lewis is a microbiology major with a minor in chemistry. She is the daughter of Mary Sutton and Ivy Lewis of Baton Rouge. She has been on the Dean’s List for six semesters and is a member of Alpha Lambda Delta Honor Society. She belongs to the Biology Society and Omega Phi Alpha National Service Sorority. Lewis is a Ronald E. McNair Scholar and a Louis Stokes-Louisiana Alliance for Minority Participation Scholar. She is also an athletic academic coach for Ragin’ Cajun student athletes. In the community, she volunteers with Hearts of Hope, United Way, Kumon Learning Center, Amelia Manor Nursing Home, Lady of the Oaks, Girl Scouts of America, Acadiana C.A.R.E.S., Habitat for Humanity, Special Olympics and Good Hope Baptist Church. She was a research assistant last summer at the University of North Carolina at Chapel Hill. Prior to that, she was a research assistant at Fossil Rim Wildlife Center. After graduation, she plans on completing a one-year internship with the National Institute of Health in Maryland. She plans to obtain her M.D./Ph.D. at Emory University in Georgia.